‘Hey, is this real?' laughed Natàlia as she tentatively touched Alistair's hair. 'You die your hair this colour?' she asked in almost perfect English, playing up to her audience of giggling girl friends. Alistair's ruddy face flushed almost as bright as his tousle of ginger hair. His burly frame squirmed, flattered by a pretty girl’s attention yet, embarrassed by the focus on his colouring. I tried to suppress a grin while William, sitting opposite with his back to the girls straightened his shoulders. The three of us were in a small restaurant in Ponta Delgada. 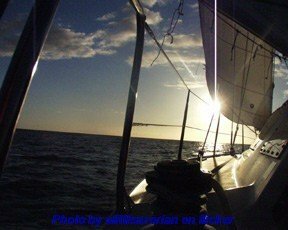 We had arrived in the capital of the Azores that morning on board the Dawn Treader, a forty-foot sailing cruiser, which we were delivering from Oporto in Portugal to her owners in Florida. William, a relation of the boat's owner, had flown over to assist with the trip. He was pleasant and willing however, work in a New York architect’s office had not prepared him for ocean sailing. We left Oporto in fine weather with light steady winds but two days out the weather became increasingly squally. One wave demolished the canvas spray-dodger as it swept over the deck. When the autopilot broke down, we could no longer trust William alone on deck while Alistair and I slept. Alistair who was responsible for the safe delivery of Dawn Treader became increasingly irritated with our ‘passenger’. It became almost as stormy on board as out. However by dawn on the morning of our tenth day at sea, conditions had settled. I was alone on watch as the sun rose, my favourite time at sea. The first rays caught the top of the mast then gradually worked their way down to warm my back and dry the deck. A steady breeze hummed in the sails, murmuring through the boat to blend with the rushing water. Dawn Treader’s hull seemed to laugh at the wavelets tickling her. A sunbeam probing the gauzy pink and lavender sky to the west, irradiated a smudge low on the horizon. After nine hundred miles there, all nimbed and shot through with mystery was São Miguel, the most easterly of the nine Azorean islands. Reluctantly, I woke Alistair to take over so I could get some sleep before closing with the island. I awoke later to a fanfare from hundreds of shearwaters and terns. We were about a quarter of a mile off the high volcanic cliffs of the southern coast of the island. The black lava rose sheer out of the translucent sea, its verdant tops and plunging dales dotted with simple whitewashed farmhouses and windmills. Clear light flashed like melted silver on the waves as a pod of bottle-nosed dolphins loped across our bow, too intent on a school of fish to play with us. The tension on board evaporated as a heady mix of land smells wafted out to us and we readied the boat for our entry into Ponta Delgado’s friendly marina. Ashore we found a small workshop where a father and son business could repair the autopilot. As we trudged with it up a narrow cobbled hill to their workshop young canaries and Azores chaffinches twittered in the hot air. By early evening we had reinstalled it on Dawn Treader and had managed to repair the damaged spray-dodger. ‘Let’s eat out tonight to celebrate,’ suggested Alistair. ‘We must look for somewhere authentic where locals eat,’ he insisted, leading the way along the white patterns on the basalt-cobbled Avenida Infante Dom Henrique. ‘Too touristy looking,’ declaimed Alistair of the first restaurant we came to. ‘No, that one looks too pretentious,’ was his comment on the next. ‘I’d settle for a packet of biscuits right now,’ I whispered to William as we trailed behind. Eventually, we followed him into a narrow street with a hodgepodge terrace of small neat houses. Alistair had a peep beyond the mesh curtains covering the plate glass window on one whitewashed building. There was no sign, no neon, nothing to suggest that this was a restaurant. Just visible, through the curtains were several diners sat at simple wooden tables and chairs set out on the tiled floor. 'But there are no free tables,' I replied impatiently. 'Hang on, someone might leave soon,' responded Alistair. putting on a thin cream cotton coat over a black skirt and blouse tossed her head back to flick her long blond hair outside her collar. They were barely out of the door before Alistair had sat at their table. A teenage waiter scurried to clear the coffee cups and cachaca glasses and brush crumbs from the crisp plain white tablecloth. A smartly dressed elderly couple, eating in the furthest corner, hummed along to a tape of an Azorean guitar playing one of the light-hearted Velhas peculiar to the islands. A grey haired man sat with his back to the room in the other corner. His wiry weather worn features bent over his plate. His spotless red checked shirt tucked into denim work trousers held up with a pair of dark blue braces, his polished brown brogues tucked under his chair. Another three tables, pushed together along one wall accommodated a clique of young women, modestly but fashionably dressed. The dark haired, moustachioed restaurateur stood beside an almost empty display cabinet looking more like a fishmonger, his stocky frame wrapped in a long white apron. He beamed as his handsome first-born tried to interpret our attempts to order from the simple menu, hand written in Portuguese. ‘Let’s each have something different, then we can share,’ suggested Alistair. ‘Hey Nuno,’ called one of the young women, who in a mixture of English and Portuguese suggested to the blushing lad what we should order. Before we could thank her, she had turned back to her friends’ giggling banter. When the food arrived Alistair’s turned out to be stewed octopus in red wine and mine was fish fillets in a heavy sauce. However, poor old William ended up with Lapas de molho Alfonso, which looked like barnacles. ‘They taste fine,’ he insisted. However, Alistair and I conveniently forgot the idea of sharing. We did however, share a superb bottle of vinhos verdes. 'Hey Alistair, don't look now but what is that hanging around that girl's neck?' I whispered. ruffle his ginger mop. As she did so, the 'amulet' was on a level with his eyes just below her small neat breasts. 'Excuse me but what is that?' He blustered. At which she made some comment in Portuguese to her friends that had them laughing uproariously. Nuno, the young waiter blushed and scurried out to the back, pushing past a shadowy dark female figure that appeared occasionally beyond the open door. The 'amulet' hanging from a string around Natàlia's neck was the same red terracotta as the ‘ashtrays’. There is a tradition on the islands of making terracotta nativity figures but this was mid summer and these were not innocent little shepherds; they were quite explicit phalluses. She then explained in perfect English that this was a prenuptial outing for Natàlia, who was about to marry, then go to live on São Jorge Island with her husband. Introducing herself as Elsa, she pointed out the others among whom there were a couple of teachers. Natàlia the bride was a chemist, Telma was a journalist and others were businesswomen. All had grown up on the island but been to the mainland for their further education. Nevertheless, all had returned to the islands to live. While conversation at the girls table was in Portuguese, it was obvious from the laughter that much of it was of a racy nature. Though we understood none of what they said, the fun was infectious. ‘We must now take Natalia home to bed,’ explained Elsa, as the girls departed leaving the now empty restaurant rather quiet. A sleepy Nuno cleared the girls’ table, studiously avoiding one of the ‘ashtrays’ they had left behind. As we left Paulo, the restaurateur held the door for us as Nuno, and even Mãe emerged from the back to wish us smiling adeus. William and I, following Alistair’s bright hair back to the marina agreed that it had been a memorable evening.